It had come to Father Green’s ears, through Emily, that the ladies of the parish, namely, the Catholic Women’s League, thought their priest was less than appreciative of them and their works. Perry sighed when he heard this, it was sometimes more than he could cope with, keeping all the elements of the parish happy. However, he valued Emily’s opinion and she seemed to think he could do no harm by giving the good ladies a little TLC. Emily had hinted that his interest could take the form of an event or outing that the women would enjoy and which he could attend with commitment and enthusiasm – quite a challenge! Perry had vague memories of previous undertakings by the CWL led by their doughty Chairwomen, Brenda Bartholomew. He had in mind a particular trip to a sewing machine museum, where he had to use all his priestly guile to avoid attending. He needed, therefore, to think hard before something equally dreadful came his way. What would constitute a decent ladies day? Then it hit him – Royal Ascot’s Ladies Day. The Gold Cup, run on the Thursday, was the centrepiece of the meeting – the Queen, the hats, Frankie Dettori, they’d love it. More to the point, he would love it. The suggestion was put to the members at the next CWL meeting, where it received a tentative reception. Mainly, it was said, because some of the ladies were worried that Father Green would be bored with such an outing. And while Perry was able to put their minds at rest on that point, Emily had taken a back seat to stifle her amusement. When the committee suggested that the Grandstand would be the most suitable enclosure at around £50 a head – bookable in advance – there were a few protests. However, Father Perry, not wanting to spend the afternoon on the heath or in the Silver Ring, enthusiastically extolled the Grandstand facilities, which included not only a better view of the race, but of Her Majesty when presenting the Gold Cup. In addition, he stressed, they would benefit from the many bars, food outlets, tote windows and overhead cover should it rain. Father Perry’s final point won over the last of the doubters, since there had been much debate about their outfits. A coach was hired and the morning dawned bright. A small crowd gathered outside the Church to see them off. It was generally agreed that the outfits, although rather varied and some bordering on the eccentric, were overall, a credit to St Joseph’s. Always hoping to air her voice, Brenda had brought along the accordionist, Colin Campbell, to provide a party atmosphere on the coach, and had also booked a local photographer to capture the ladies haute couture. On the journey, Colin, sitting on the back seat, played a selection of songs from the shows, unaware that the singing and chatter from three dozen excitable women was making it increasingly difficult for Perry to study his Racing Post. But study he did. If anyone, including Emily and Brenda, had expected Father Green to stay with them once inside the Grandstand, they were soon disillusioned, as he quickly melted into the crowd. Punting wise, Perry would agree, this was not his finest hour – four straight losers including his nap and next best, had almost emptied his wallet. To make matters worse, although desperate for a drink, he had decided to steer clear of the bars to avoid being waylaid by zealous parishioners. Finally, however, the combination of losing and lying low began to take its toll. He had to have that drink and do a couple of forecasts – at least try to get out of trouble. He was just downing his second whiskey in quick succession when two of his parish ladies spotted him from across the bar and within seconds it was too late. “We’ll come with you,” was the dreaded response. And so it was that Father Perry Green watched the penultimate race – the Chesham Stakes, without a penny on the much fancied World Premier, while his two companions twittered on endlessly. Mercifully, as they left, he joined a nearby Tote queue to have his last £10 on a dual forecast – but on what? He scanned the racecard. Diaghilef was carrying 9st 7lb – top weight and 40-1 – “Even so,” he thought, “top weights are sometimes favoured by firm ground. So, smiling at the Tote girl he muttered, “Nil Desperandum,” and kissed his tenner goodbye. The queue at the coffee stall must have been very long, for Perry had time to watch the race on a TV monitor under the stands. The King George V Handicap was over a mile and a half, so the horses would start away to the left on the far side of the course – all 20 of them. Perry scanned the TV for his colours, but with such a big field the images were too small for him to identify clearly, worse still, the shouts of the punters drowned out the commentary – anyway, it looked like a blanket finish. Just then Maureen and Molly returned. Suddenly, he found himself sweating – the noise and the disappointment had finally got to him. What happened next, Perry could never explain. Did he really faint, or was it his self-preservation coming to the rescue as it had in the past. He remembers Maureen’s anxious face and someone calling out, “Look out the priest is falling”. Many willing hands worked towards this end. Until at last, Perry found himself sitting quietly on a bench on the Grandstand lawn. Which he did, but not before revisiting the Tote windows, where incredibly, he learned that the payout for his £10 dual forecast was £4,147 – “Certainly Nil Desperandum there,” he mused, and looking back, thought it could be his biggest win ever. Meanwhile the ladies assured each other that in spite of everything, Father Green looked to have enjoyed the day. Maureen and Molly vouched that he never stopped smiling all the way home. Later, Emily gave further testimony that his smile had continued well into the evening. With Derby Day honoured to start the Queen’s Diamond Jubilee celebrations, what better winner than one named after the legendary court of a king – Camelot. And to please the media, this was a Derby with many stories – the smallest field since 1907; the shortest priced favourite since Tudor Minstrel in 1947; the fourth winner of the race in eight years by Montjeu and, the first time a father & son were the Derby winning trainer & jockey. But let’s start at the beginning. Camelot, a well-made bay colt, was purchased by Coolmore for 525,000 guineas from Highclere Stud at the Tattersalls October Yearling Sale. His dam, Tarfah (by Kingmambo), won five races including the Dahlia Stakes at Newmarket and had one previous winner – Ideal, by Galileo. Trained by Aidan O’Brien at Ballydoyle and ridden by his son Joseph, Camelot commenced his career at Leopardstown, winning an 2-y-o Maiden over one mile in mid-July. In October, he travelled to Doncaster for the Racing Post Trophy, and after an impressive performance, beating Jim Bolger’s Zip Top by 2¼ lengths, he became the winter favourite for the Derby. Camelot made his 3-y-o debut in the Two Thousand Guineas; kept at the rear of the field throughout, he burst through inside the final furlong, to win by a neck, from French Fifteen. 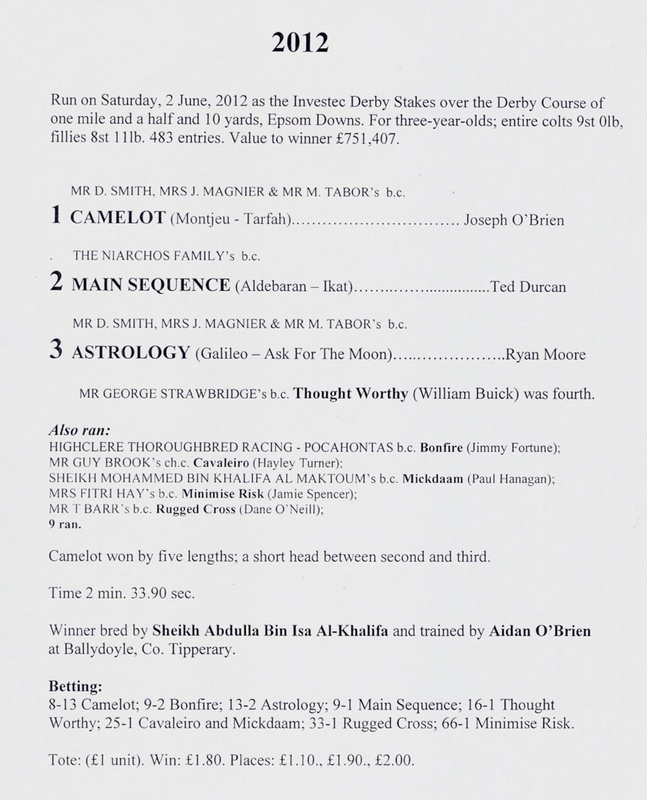 The following Derby trials brought forth their challengers, but despite victories for Bonfire in the Dante Stakes, Mickdam and Astrology in the Chester Vase and Dee Stakes and Main Sequence in the Lingfield Derby Trial, this year run on the All-weather course, none could prevent Camelot from starting the 8-13 favourite. The weather, cold and blustery for the Queen’s arrival, changed suddenly to sunshine in time for the Derby. All nine runners got off to a good start, and after the first furlong, Astrology led Thought Worthy and Rugged Cross. There was little change in the order to the top of the hill, where Camelot remained last but one. Rounding Tattenham Corner, Astrology and Thought Worthy fought out the lead, while Camelot was still seven lengths adrift. However, approaching the two furlong marker, 19-year-old, Joseph O’Brien boldly brought Camelot with a strong run up the outside, to join Astrology at the furlong pole, then, accelerated away to win easily by five lengths. Main Sequence ran on gamely to be second, with Astrology third, a short head away. The winning time was 2 min. 33.90 sec. The last horse home was Cavaleiro, ridden by Hayley Turner, matching the position of Alex Greaves, aboard Portuguese Lil in 1996; Haley and Alex being the only ladies to have ridden in the Derby. In the interviews that followed the trophy presentation to owners, Derek Smith, Mrs John Magnier and Michael Tabor, it became apparent that their wishes were to run Camelot in the St Leger, and so attempt the first Triple Crown victory since Nijinsky in 1970. Finally, the estimated attendance of 130,000, was an encouraging sign for Investec, who have renewed their sponsorship for a further 10 years. together with the details of Montjeu’s four Epsom Derby winners.